If you’re not adventurous enough to voluntairly dive off a steep sea cliff, you may prefer to experience cliff diving by playing Flip Diving. 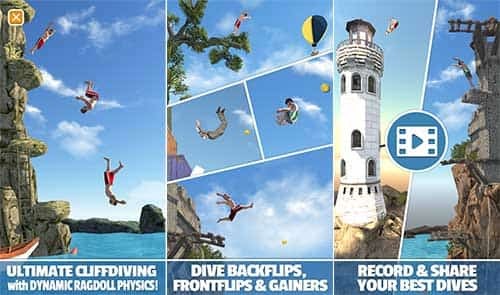 To discover what is Flip Diving about and features of the game, simply continue reading. 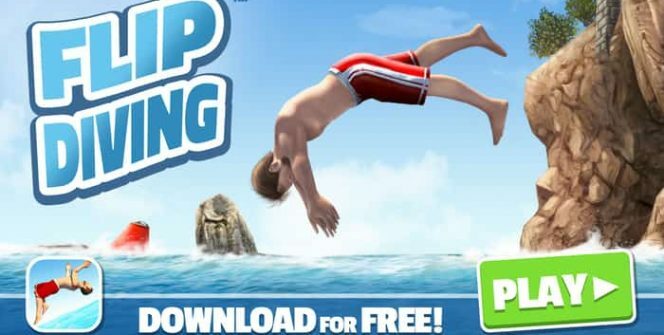 Flip Diving is essentially a physics based game, which requires players to learn the mechanics of diving in order to expertly execute death defying dives. 1. A multitude of unlockable characters. If you assumed that you’d be able to quickly Flip Diving but repeatedly jumping with the same character, think again. 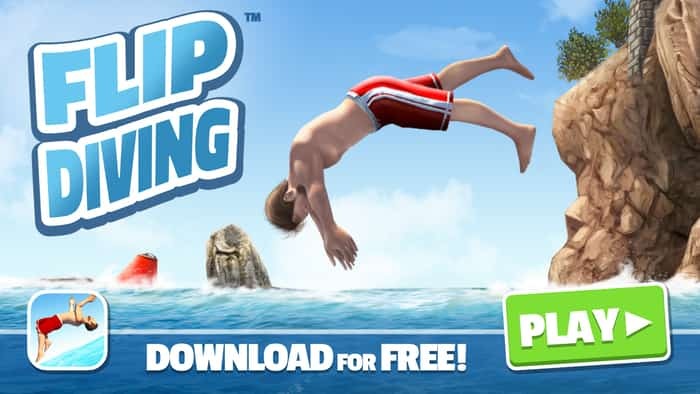 As you progress through Flip Diving’s levels you’ll unlock new characters to complete new dives with. As each character will weigh a different amount and will have a different center of gravity, you’ll need to alter your technique in order to successfully nail dives with new characters. As a bonus, each of the special characters which you’ll unlock with have a larger than life personality and a few special abilities, that will come in handy. Once you start to excel at cliff jumping, you’ll be able to film your epic dives to share with your friends and family members. So if you want to show your friends how a professional diver completes a dive, it’s well worth sharing your best dives with your chosen social network. One of the reasons while you’re likely to keep returning back to Flip Diving is that it’s a whole lot of fun unlocking new jumps. As examples, as you progress through Flip Diving’s levels you’ll be able to dive off trees, trampolines and boats. All of which pose different challenges. So if you love the idea of being able to trampoline into the water, you’re in luck. Just make sure to nail your landing perfectly and to enter the water at an optimal angle in order to avoid badly injuring your chosen character. In order to receive a high score for your dive, you’ll have to try and complete as many perfect rotations as possible before you enter the water. In order to tumble as many times as possible, make sure to perfectly time your last flip, so that you don’t accidentally hit the water horizontally. Sometimes you’ll be faced with the difficult dilemma of whether it’s better to play it safe or whether you can fit one more rotation in, before you break the water’s surface. Thankfully, the more often you play Flip Diving, the easier you should find it to estimate how many flips you’ll successfully be able to make before you hit the water. There are a multitude of milestones which you can work to tick off in order to try and achieve 100% game completion. So if you’re up for a challenge, it’s well worth ticking off Flip Diving’s milestones off, one by one! So if you want to live out your dream of being an Olympic high diver or a confident cliff diver, do yourself a favor and play Flip Diving in the safety of your own home, instead. Sometimes when playing Flip Diving, bluestacks ask you fee to pay but gives you option to download some apps. Every time it asks you just select “Install apps” and continue using it free. I hope you enjoyed this article, please rate and share. If you have problems running Flip Diving on your desktop or any other issues, leave a comment below.